Early last year Dr. Lonn published the results of a Swedish study, which found an increased risk of acoustic neuroma, a type of brain tumor, after 10 or more years of cell phone use. This year he published more research results, which showed that cell phones did not increase the risk of other brain tumor types (gliomas or meningiomas). These types of conflicting reports often leave the public unsure about whether cell phones pose a risk or not. Dr. Lonn’s work is part of the Interphone study, a 14-country research project initiated by the World Health Organization (WHO). The results of the Interphone study are due in 2006. Meanwhile, the WHO suggests that persons concerned about cell phone use can limit the length of calls, use a “”hands- free”” device to keep cell phones away from the head and body, and avoid using cell phones while driving. NBTF has endorsed these guidelines. In addition to Dr Lonn’s article, the NBTF newsletter contains the views of prominent health professionals and scientists regarding the possible link between cell phone use and brain tumors. Each year over 40,000 people in the United States are diagnosed with a primary brain tumor and 360,000 Americans are currently living with a brain tumor. There are over 120 different types of brain tumors. Despite numerous studies about brain tumors, their causes remain unknown. The National Brain Tumor Foundation raises funds for research into the causes of brain tumors and to improve treatments. 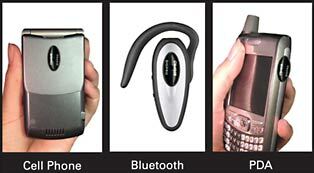 “Ifit Headset An exclusive breakthrough in telephone EMF mitigation from Less EMF Inc! A full featured desktop or wall mount corded telephone (no microwaves) combined with a special ultra low EMF headset. You get all the benefits of a normal telephone without putting yourself close to the strong magnetic fields associated with the handset, speakerphone, or telephone base. The special headset cord is about 3 feet long and uses a clear plastic tube to carry the sound to your ear. Absolutely no electronics, wires or magnets are near your head. Cord provides distance from telephone base and traditional handset, convenient mobility, and can be extended up to 9 feet with option extension cord, sold separately. Tested and approved by Less EMF Inc., field reduction is dramatic. No special wiring or installation is required. Phone includes speed dial, redial, speakerphone and hold features. Phone is white, and has volume control. Phone can also be used in normal fashion by those not affected by EMF. The phone itself does not have any special shielding nor EMF reduction technology. The whole benefit is that it has the jack for the special headset. “Airtube Headsets As seen on CNN – Use a “”Hollow Tube”” earpiece to prevent radiation exposure. We tested the Original iFit RF3 Headsets on “”RICK”” our test dummy head at RangeStar Testing Facilities with a SAR “Standard Absorption Rate”” level result of ZERO. • The Cellphone transmits a radio signal into the atmosphere that communicates with the cell tower. • The radio wave is in the “”Micro Wave”” spectrum field of 1.8 to 2.3 GHz. • The “”WIRED”” headset has a conductive copper/metal wire that the EMF or radio signal can travel up, delivering the EMF directly into your head. The “”Radio Wave”” or transmission from the Cellphone does not know the difference from the wire of a headset and an ANTENNA. The EMF then travels up the wire by naturally “”Clinging to the Conductive Wire””. Preventing the EMF from reaching your head. • With the RF3 headset the EMF travels up the wire to a speaker box. • From that point on, the speaker box converts the electronic signal into “”Natural”” sound waves that travel up the Airtube to your ear canal. Similar to how a speaker works on your stereo. • The sound waves travel from the speaker box without any EMF. Thus, delivering the caller’s voice safely to your ear. The EMF is well within a safe distance from your soft tissue found in the Blood Brain Barrier. But that’s also another story. In 1993, the National Institutes of health and Department of Energy began an extensive review of all studies on the possible health effects of electromagnetic fields. six years later they completed their project, called the Electric and Magnetic Fields research and public Information Dissemination (EMF RAPID) program, and reported their findings to Congress: scientific evidence of human health risk from EMF exposure is “weak,” they concluded. In fact, biological impacts of EMFs–therapeutic ones–are well known. Low-level frequencies are commonly used to promote healing of wounds and bone fractures, and experimental studies show positive effects of pulsed EMFs in treating pain and depression. recently, Michael persinger, PhD, a cognitive neuroscientist at Laurentian University, found that pulsed magnetic fields also halted the growth of melanoma cells in mice. What was wrong with the La Quinta School? According to epidemiologist Sam Milham, MD, the middle school was rife with the usual suspects– fluorescent lighting, electronic devices–whose toxic effects were exacerbated by an electrical supply overloaded with high-voltage transients. Here, a partial spectrum of the electromagnetic fields that surround us, from strong (waves of extremely high frequency and short length) to weak (waves of extremely low frequency and long length). In each category, you’ll find sources that generate the EMF, and associated health risks from overexposure. Of course, these small studies–from Milham, Hydro-Quebec, and Havas– hardly constitute a blanket indictment of transients. “We’re still early in this part of the EMF story,” says Carpenter. Does that mean as evidence of their harm accumulates, officials will raise a red flag? Not likely, if past EMF debates are any indication. Power companies have successfully beaten back attempts to modify exposure standards, and the cell phone industry, which has funded at least 87% of the research on the subject, has effectively resisted regulation. One good reason has had to do with latency–how long it takes to develop a particular cancer, often 25 years or more. Cell phones have been around only about that long. But does that mean we avoid any discussion of their possible dangers? Again, if the past is a guide, the answer appears to be “probably.” American scientists worried about the hazards of smoking, the DES (diethylstilbestrol) pill (given to pregnant women, it caused birth defects), asbestos, PCBs (polychlorinated biphenyls)–the list is lengthy–but officially warned about exposure only after they could say with absolute certainty that these things were harmful. As for protecting ourselves from toxic radiation, we have a lax–and laughable–history. In the 1920s, just a few years after medical imaging devices were invented, physicians were known to entertain their guests by x-raying them at garden parties. In the 1930s, scientists often kept radium in open trays on their desks. Shoe stores used x-ray machines in the 1940s to properly fit children’s feet, and radioactive wristwatches with glowing hour hands were popular in the 1950s. All of which means that, absent prudent safety standards from both public officials and manufacturers (adding a protective filter would add 5 cents to the cost of making a CFL and $5 to the cost of a laptop), you’ll have to protect yourself from EMFs. Here’s a reasonable proposition: Practice what is known in Europe as the precautionary principle, which is pretty much what it sounds like. Don’t expose yourself unnecessarily to EMF hazards. Don’t buy a home next to a WiFi tower. Get a corded telephone instead of a cordless one. Don’t let your teenager sleep with a cell phone under her pillow. Don’t use your laptop computer in your lap. Treat your EMF-emitting devices with the same cautious respect you do other invaluable modern devices, like your car, which is also dangerous–and can kill. You don’t drive in an unnecessarily risky fashion–at high speed or while talking on a cell phone (right?). Some preliminary research implies the answer is yes. Over the past 3 years, Magda Havas, PhD, a researcher in the department of environmental and resource studies at Trent University in Ontario, has published several studies that suggest exposure to transients may elevate blood sugar levels among people with diabetes and prediabetes and that people with multiple sclerosis improve their balance and have fewer tremors after just a few days in a transient- free environment. Her work also shows that after schools installed filters to clean up transients, two-thirds of teachers reported improvement in symptoms that had been plaguing them, including headache, dry eye, facial flushing, asthma, skin irritation, and depression. Transients are particularly insidious because they accumulate and strengthen, their frequency reaching into the dangerous RF range. Because they travel along home and utility wiring, your neighbor’s energy choices will affect the electrical pollution in your house. In other words, a CFL illuminating a porch down the block can send nasty transients into your bedroom. Something else is sending transients into your home: the earth. From your high school science texts, you know that electricity must travel along a complete circuit, always returning to its source (the utility) along a neutral wire. In the early 1990s, says Stetzer, as transients began overloading utility wiring, public service commissions in many states told utilities to drive neutral rods into the ground on every existing pole and every new one they erected. “Today, more than 70% of all current going out on the wires returns to substations via the earth,” says Stetzer–encountering along the way all sorts of subterranean conductors, such as water, sewer, and natural-gas pipes, that ferry even more electrical pollution into your home. •	When television (also radio wave) was introduced in Australia in 1956, researchers there documented a rapid increase in cancers among people who lived near transmission towers. •	In the 1970s, Nancy Wertheimer, PhD, a Denver epidemiologist (since deceased), detected a spike in childhood leukemia (a rare disease) among kids who lived near electric power lines, prompting a rash of studies that arrived at similar conclusions. •	In the 1980s, investigators concluded that office workers with high exposure to EMFs from electronics had higher incidences of melanoma–a disease most often associated with sun exposure– than outdoor workers. •	In 1998, researchers with the National Cancer Institute reported that childhood leukemia risks were “significantly elevated” in children whose mothers used electric blankets during pregnancy and in children who used hair dryers, video machines in arcades, and video games connected to TVs. •	Over the past few years, investigators have examined cancer clusters on Cape Cod, which has a huge US Air Force radar array called PAVE PAWS, and Nantucket, home to a powerful Loran- Cantenna. Counties in both areas have the highest incidences of all cancers in the entire state of Massachusetts. •	More recently, the new findings on transients–particularly those crawling along utility wiring–are causing some scientists to rethink that part of the EMF debate pertaining to the hazards of power lines. Could they have been focusing on the wrong part of the EMF spectrum? “For the first time in our evolutionary history, we have generated an entire secondary, virtual, densely complex environment–an electromagnetic soup–that essentially overlaps the human nervous system,” says Michael Persinger, PhD, a neuroscientist at Laurentian University who has studied the effects of EMFs on cancer cells. And it appears that, more than a century after Thomas Edison switched on his first lightbulb, the health consequences of that continual overlap are just now beginning to be documented. Until Edison’s harnessing of electricity, humans’ only sources of EMF exposure were the earth’s static magnetic field (which causes a compass needle to point north) and cosmic rays from the sun and outer space; over our long evolution, we’ve adapted to solar EMFs by developing protective pigment. “But we have no protection against other EMF frequencies,” says Andrew Marino, PhD, JD, a pioneer in bioelectromagnetics who has done extensive EMF research and a professor in the department of orthopedic surgery at the Louisiana State Health Sciences Center. •	The Russians first noticed during World War II that radar operators (radar operates using radio frequency waves) often came down with symptoms we now attribute to electrical hypersensitivity syndrome. In the 1960s, during the height of the Cold War, they secretly bombarded the US embassy in Moscow with microwave radiation (a higher-frequency RF used to transmit wireless signals), sickening American employees. Radio wave sickness– also called microwave sickness– is now a commonly accepted diagnosis. Every single study of brain tumors that looks at 10 or more years of use shows an increased risk of brain cancer,” says Cindy Sage, MA, coeditor of the report. A recent study from Sweden is particularly frightening, suggesting that if you started using a cell phone as a teen, you have a 5 times greater risk of brain cancer than those who started as an adult. The risk rises even more for people who use the phone on only one side of the head. While defenders of cell phone safety claim no scientist can explain why EMFs may be harmful in humans, a body of reliable and consistent animal research shows that electromagnetic fields, equal to those generated by mobile phones, open the blood-brain barrier, causing blood vessels to leak fluid into the brain and damage neurons. Ironically, that research (by renowned Swedish neuro-oncologist Leif G. Salford, MD, PhD) began with the goal of finding a way to deliver chemotherapy to brain tumors. Other countries are revising exposure standards. Members of the European Union, which has led the way on EMF investigations, are moving quickly to protect their citizens, particularly children and pregnant women. In the past 2 years alone, France, Germany, and England have dismantled wireless networks in schools and public libraries, and other countries are pressing to follow suit. Israel has banned the placement of cellular antennae on residences, and Russian officials have advised against cell phone use for children under 18. Electrical hypersensitivity (EHS) is becoming more widespread. Symptoms of EHS, a recently identified condition, include fatigue, facial irritation (resembling rosacea), tinnitus, dizziness, and digestive disturbances, which occur after exposure to visual display units, mobile phones, WiFi equipment, and commonplace appliances. Experts say up to 3% of all people are clinically hypersensitive, as many as one-third of us to a lesser degree. Milham was especially interested in measuring the ambient levels of a particular kind of EMF, a relatively new suspected carcinogen known as high-frequency voltage transients, or “dirty electricity.” Transients are largely by-products of modern energy-efficient electronics and appliances–from computers, refrigerators, and plasma TVs to compact fluorescent lightbulbs and dimmer switches–which tamp down the electricity they use. This manipulation of current creates a wildly fluctuating and potentially dangerous electromagnetic field that not only radiates into the immediate environment but also can back up along home or office wiring all the way to the utility, infecting every energy customer in between. With Cohen’s help, Milham entered the school after hours one day to take readings. Astonishingly, in some classrooms he found the surges of transient pollution exceeded his meter’s ability to gauge them. His preliminary findings prompted the teachers to file a complaint with the Occupational Safety and Health Administration, which in turn ordered a full investigation by the California Department of Health Care Services. The final analysis, reported by Milham and his colleague, L. Lloyd Morgan, in 2008 in the American Journal of Industrial Medicine: Cumulative exposure to transients in the school increased the likelihood a teacher would develop cancer by 64%. A single year of working in the building raised risk by 21%. The teachers’ chances of developing melanoma, thyroid cancer, and uterine cancer were particularly high, as great as 13 times the average. Although not included in the tabulations, the risks for young students were probably even greater.